I was having a sacred moment. I think Tom was too. It was this past Friday. April 25, 2014. I’ve changed my mind because for the first time, I’ve seen where my body’s final resting place will be. And I was overwhelmed. The moment was indeed sacred. This sacred moment started in the administration building of Arlington Cemetery, where a kind woman, Christine, informed Tom and I that we do indeed have two spots, all our own waiting for us upon our death. (Tom thought we were going to be buried on top of each other.) These graves are on either side of his infant son, who died at birth on April 22, 1959 when Tom was in the United States Army. So, Christine gave us a map of the grave’s location and we took off to find it. There were steps. Lots of steps. So Tom chose to wait for me at the bottom of the hill. It didn’t take too long – about 10 minutes – which was when I discovered the backside of all the tombstones were marked with the section and number. And I found it. 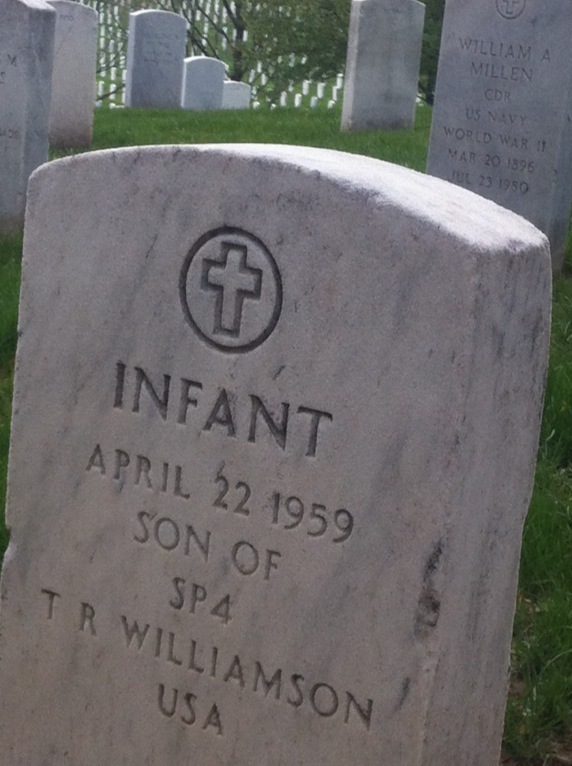 All these years hearing about this infant child buried in Arlington Cemetery became a reality to my heart and not just my mind, flooding my emotions producing another sacred moment. It’s in section 31. Number 8015. Under a beautiful tree. And sure enough the spots to the right and left of “Infant Son of T R Williamson SP 4” are empty – just waiting on Tom and his wife. It is a glorious spot. And now for the first time in my life, I actually care about where my body – which will still be united to Christ – that body which will be raised again in the second coming of Christ – rising from the grave – all glorified and fabulous – will finally rest. I can’t help but notice the parallel with eternity. You see, I am relying on someone else’s merit to get me into Arlington Cemetery – my husband’s. I did nothing to earn this honorable status – a status I am now feeling elated over. Have you seen it!? It is incredible. And overwhelming. And sacred. Truly hallowed ground. Lots of bodies, resting in their graves. It made me utterly excited for the resurrection of the body one day – when I get to rise with other bodies from the past 150+ years. From slaves to presidents. Those known and unknown. Since this moment at Arlington over a week ago now, I’ve been wondering about the resurrection of the dead, (a.k.a. the second coming of Christ), that moment when our bodies and souls will reunite once again. Will we all rise at the same time – all 400,000+ bodies at Arlington not to mention what the seas and every grave on the earth will give up? Or will it be only those known by Jesus? And will it be in some sort of succession? This has got to be a moment to end all moments. And then, will God go about separating sheep from goats? (Matthew 25:31ff.) If so, you can be sure I’ll be banking on Jesus’ merit and not Tom’s. And definitely not mine. Whatever that day will look like, I do believe we will all be amazed, shocked, overwhelmed and frightened. I truly don’t think we can fath om it until it happens – but that doesn’t stop me from getting terribly excited and I do believe this excitement was ratcheted up because on April 25, 2014 as I stood on my final resting place it all became just a bit more real. “What benefits do believers receive from Christ at death?